Randy Rainbow Song Parody …. “😂 DESPERATE CHEETO …. You’ll love this one, Mr. ‘So-Called-President’ 😂 …. Belieb me …. “!! “Despacito‘ is a song very close to my heart. It took over the airwaves, cyberspace and traveled the world over. Why so special? Because it was written and performed by Puerto Rican talent, artists and performers. At a time as serious as these, humor always lightens up the situation, even though momentarily. Ricky Martin On ‘Ellen’ …. “🇵🇷 Recaps His Heartbreaking Yet Hopeful Visit to Puerto Rico 🇵🇷 …. Asking for Your Help …. “!! He has always been known for his love of the Island. After the damaging effects and aftermath of Hurricane María, he has embarked on a mission to help the people of his Island. He’s going back this Sunday, October 8, with 120 tons of supplies to deliver. I’m very proud to be a fellow countrywoman to this wonderful human being! 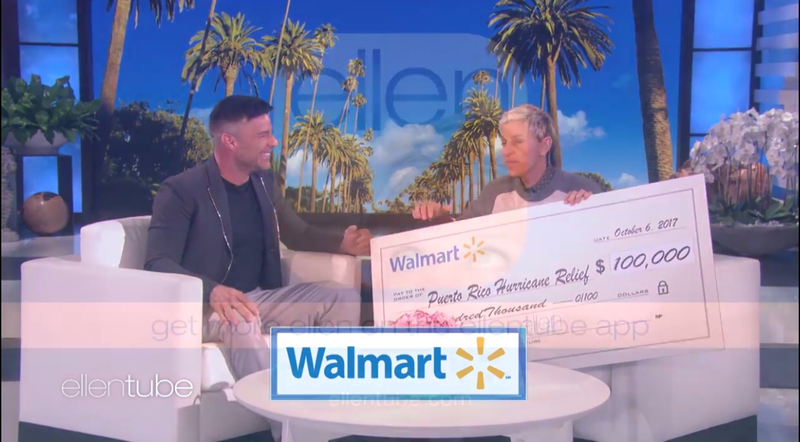 Ricky Martin returned to Ellen Friday to discuss his recent trip to Puerto Rico, where the singer distributed basic necessities to those affected by Hurricane Maria. “I don’t wanna be pessimistic, I just want to be realistic: The images don’t do justice to what really happened in Puerto Rico. Martin added that he was returning to the island on Sunday with a FedEx plane filled with basic necessities for those still recovering from Hurricane Maria. 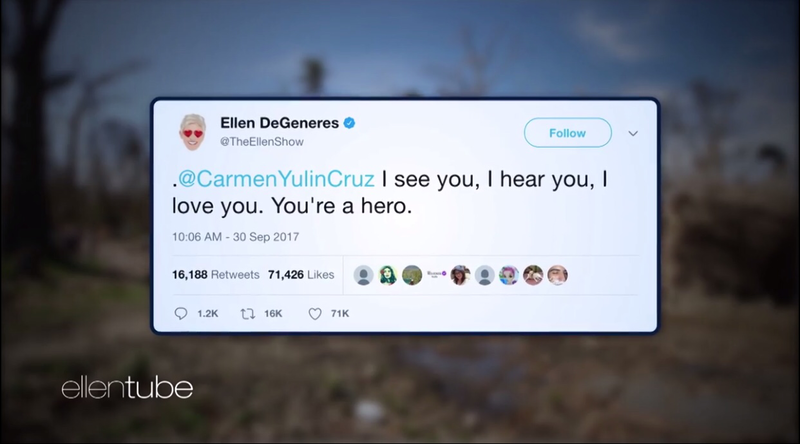 Martin also thanked Ellen viewers for assisting in his YouCaring relief efforts, which saw its donations increase from $200,000 to $1.8 million following his last appearance on the show. Puerto Rico has been devastated by Hurricane Maria, and the island desperately need us. This is a humanitarian crisis affecting 3.5 million people. The power grid is destroyed, food and water are in short supply and we all need to work together now. For this reason, I created this page to collect funds and my donation of $100,000 is already in, as well as the generous donations from the Leonardo DiCaprio Foundation and many others. 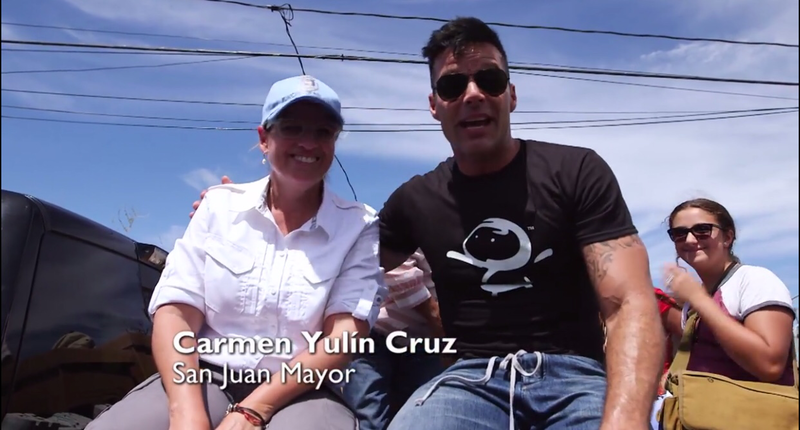 The Ricky Martin Foundation team on the ground is already working with the local government, local volunteers. The Puerto Rico native returned to the show to share details about his visit to his homeland, where millions of Americans are still suffering from the effects of the hurricanes. Visit Puerto Rico …. “🇵🇷 Honest Government Advertisement … This is for Real 🇵🇷 …. “!! This is my country, as many of you well know. This is the place where I was born and raised. It’s no secret that Puerto Rico has been going through quite the rough patch since the American invasion in 1898. However, fast-forward to the present and catch a glimpse of the Island’s current reality. I will soon be working on the Hawaii video which the creators mentioned in their article. My heart bleeds for my country! After the Visit Hawai’ i video, SO many Boricuas asked us to make one about the current situation in Puerto Rico; I’ve never received so many requests for a video – so we just had to do it! that Puerto Rico is a US colony. That’s why I decided to focus on this (rather than weigh in on the subject of political status, which is for Boricuas to decide). I spent way too long creating this image for the Visit Puerto Rico/Honest Government Advert I’m currently making. May as well make a post out of it. The US Government just released this tourism ad for Puerto Rico and it’s surprisingly honest and informative.